In Influencing Enterprise Risk Mitigation, author Francis J. D’Addario draws on his many years of impressive security experience to describe business risk prevention and mitigation strategies. D’Addario, former security manager at Starbucks, Hardee’s, and Jerrico, shares stories of risk mitigation successes and failures—including natural disasters, a triple murder, and multimillion dollar fraud schemes—to help explain the need for an all-hazard risk mitigation approach. In this book, the author discusses the psychology of security, the geography of risk, and baseline identity authentication and access control measures. He also talks through the steps for making security a priority for the business, estimating return on investment for security services, and leveraging data to learn from the mistakes and successes of those who came before us. The ability to quantify the benefits of risk mitigation will influence business investment in prevention and response preparedness. Influencing Enterprise Risk Mitigation teaches us that both hazards and mitigation opportunities in the enterprise start at the individual and community level, and that recovery from a catastrophe hinges on individual and community resiliency. 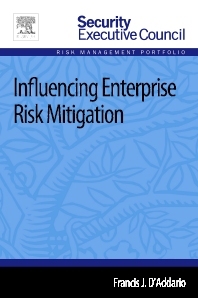 Influencing Enterprise Risk Mitigation is a part of Elsevier’s Security Executive Council Risk Management Portfolio, a collection of real world solutions and "how-to" guidelines that equip executives, practitioners, and educators with proven information for successful security and risk management programs. Chapter 3. Who’s Who in the Zoo? How Do We Make Sure this Never Happens Again, Globally? Francis is a seasoned all-hazards risk mitigation leader for multinational convenience, food and beverage, manufacturing, restaurant, retail, and supply chain operators. He has served as chief security officer for Starbucks Coffee, Hardees Food Systems, and Jerrico Inc. His expertise includes risk diligence, loss prevention and mitigation systems design, as well as contribution analytics. Francis was named as one of the top 25 "Most Influential People in Security" of 2009 by Security magazine, and was a CSO magazine 2007 Compass Award honoree. He is also the critically acclaimed author of Not a Moment to Lose…Influencing Global Security One Community at a Time (2010), The Manager’s Violence Survival Guide (1995), and Loss Prevention through Crime Analysis (1989).